Rouse pictured during Offaly's All-Ireland Round 2 qualifier against Clare. PAUL ROUSE HAS ruled himself out of taking charge of the Offaly footballers on a permanent basis. The UCD history lecturer took over as interim manager the wake of Stephen Wallace’s departure after the county’s surprise early exit from the Leinster SFC at the hands of Wicklow. He led Offaly to a first round qualifier win over Antrim, but his side’s season ended at the hands of Clare on 24 June with a 2-14 to 1-19 defeat in Tullamore. An Offaly statement released to The42 explained that other commitments meant he would not be putting his name forward for the full-time role. 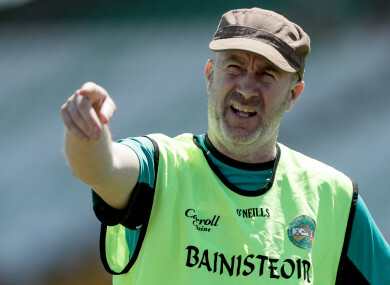 “Due to work, family and travel commitments, Paul sadly is unable at this time to put his name forward for the position of Offaly senior football manager,” the statement said. Email “Interim boss Rouse rules himself out of running for Offaly job on permanent basis”. Feedback on “Interim boss Rouse rules himself out of running for Offaly job on permanent basis”.